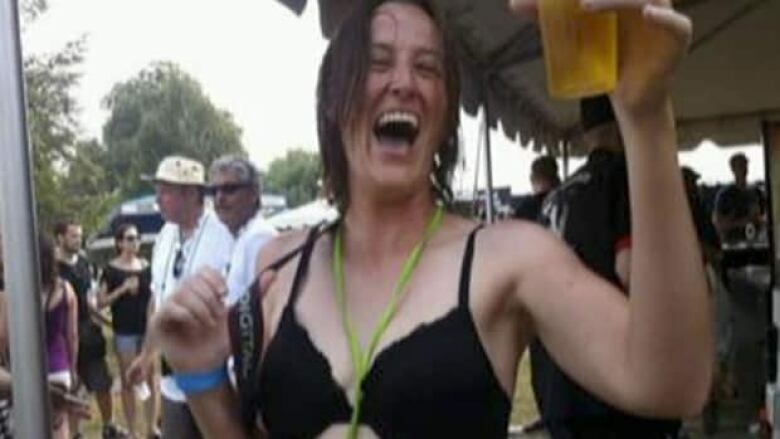 More than two decades after a woman from Guelph, Ont., won the right to take off her shirt in public, a Toronto woman is complaining that organizers at a local beer festival told her it wasn't allowed. Jeanette Martin was at the annual Toronto beer gathering on Sunday when she took up a dare from one of her friends and took off her shirt. She was wearing a bra but apparently that wasn't enough for organizers. "Within 10 seconds flat I had a security guard telling me to put my top back on or else I'd be escorted out of the grounds," Martin told CBC News. Martin was told that she would attract unwanted attention from men and her safety was at risk. "I didn't feel unsafe," she said. "I just wanted to be comfortable." Martin said she was shocked. "Hot pink string bikinis are okay — a plain normal black bra is not okay." The incident comes 20 years after Gwen Jacobs took off her shirt while walking in Guelph on a 33 C day. Jacobs, who was not wearing a bra, took her fight all the way to Ontario's Court of Appeal where she was vindicated. The court struck down a lower court ruling. In part, the Appeal Court decision said "there was nothing degrading or dehumanizing in what the appellant did. The scope of her activity was limited and was entirely non-commercial. No one who was offended was forced to continue looking at her." Since that 1996 decision it has been legal for women to remove their tops in public in Ontario. Martin said the people who told her to cover up were looking at the problem the wrong way. "Deal with the guys if there is a problem," she said, "but don't come over and pre-emptively tell me that I'm going to start a problem." "This is the reason we have events like SlutWalk now — to bring attention to the fact that we're not just sexual beings, we're just out having a good time." Martin's not sure why she got so much attention at the beer fest. The security team apologized and she's had lots of support, even from her parents. "I actually think they'll be very proud of me for standing up for my rights — and it is an issue of rights for women to be able to do this without being sexualized," Martin said.